SCVHistory.com LO8801 | Tejon Ranch | Church at Ex-Sebastian Indian Reservation, 1888-1900. Church at former Sebastian Indian Reservation on the Tejon Ranch, 1888-1900. Image by the famous Western photographer Carleton E. Watkins (1829-1916) in the Library of Congress (Watkins photo No. W535). Photo also shows a mounted rider and an arroyo. Gen. Edward F. Beale, then-Indian superintendent for California and Nevada, established the San Sebastian (aka Tejon) Indian Reservation in 1852 on Yokuts land in the Southern San Joaquin Valley that he would later own. The U.S. Army established Fort Tejon in 1854 largely to keep watch over the reservation. Using soldiers at his command*, Beale rounded up Indians from miles around and herded them onto the reservation to facilitate American settlement of their lands. Among them were Tataviam people originally from villages in Newhall and Castaic — one of whom, Estanislao Cabuti, aka Stanislaus, born at Tochonanga (Newhall), became a capitan at the reservation —; Barbareno Chumash living at San Emigdio after the Chumash Revolt of 1824; Kitanemuk from the Antelope Valley; Yokuts from the San Joaquin Valley (historically enemies of the Kitanemuk, but intermarried anyway); and even Paiutes from 200 miles away in the Owens Valley (many of whom escaped along the way and returned to their ancestral homes). The Army began to shut down the fort when the U.S. Civil War broke out and closed it, and the reservation, for good in 1854. Some of the Indians were transfered to the Tule River Reservation in an unfamiliar area southeast of Visalia, but some managed to avoid the move and returned to their homelands while others remained in the Tejon area and worked as ranch hands for Beale, who now (1865) owned the property. * This is meant in a practical sense, not chain-of-command. Carleton E. Watkins was born in Oneonta, Oswego county, New York, on November 11, 1829. He was the youngest of five children of a Scottish innkeeper. During his youth he became acquainted with Collis P. Huntington, who frequented his father's hotel. Soon after the discovery of gold, both young men went to California, where Huntington later became one of the Big Four who built the Central Pacific Railroad. In 1854, while working as a clerk in a store on Montgomery Street, Watkins met R. H. Vance, the daguerreotypist who had studios in San Francisco, San Jose and Sacramento. The employee at Vance's San Jose studio had suddenly quit and Vance asked Watkins if he would fill in until a permanent replacement could be found. Although he knew nothing of photographic processes, Watkins agreed. For the first few days he was simply the care-taker of the studio, but when Vance could not find a new operator, he instructed Watkins in coating the daguerreotype plates and making exposures. With only the briefest instructions, Watkins was able to make portraits and completely operated the gallery for a short period. In 1857 or 1858 Watkins returned to San Francisco where he established his own photographic studio for portraits and view photography. Watkins usually spent a large portion of the summer traveling throughout California, leaving his gallery and studio in the hands of an assistant. In 1858 or 1859 he visited the Mariposa Grove and was the first person to photograph the "Grizzly Giant." In 1861, Watkins visited the Yosemite Valley and made the first 18" x 22" landscape photographs in California (and possibly the world). He made many more trips to Yosemite during the 1860s and 1870s. In 1868 Watkins made his first trip to Oregon, where he made the first photographic reproductions of the Columbia River. Five years later, Watkins went to Utah with his wagon, team and photographic equipment on railroad cars. Thanks to his friend Collis P. Huntington, he traveled free. He was accompanied on this trip by close friend and artist William Keith, who made extensive use of Watkins' photographs for many of his oil paintings. During the winter of 1871-72, Watkins expanded his San Francisco gallery (the Yosemite Gallery), which put an extra strain on his finances. When the Bank of California went under in 1874, Watkins lost his Yosemite Art Gallery to competitors J.J. Cook and I.W. Taber. Not only did his competitors take over his Gallery, they took all of his negatives as well. Watkins then began the task of rebuilding his collection, which meant rephotographing many of the sites he had visited earlier in his career. "Watkins' New Series" of views replaced those lost in the foreclosure. Watkins did become reassociated with the Yosemite Gallery, first as a photographer, and later as manager, but never as the owner. Watkins went to the Comstock Lode, near Virginia City, Nevada, in 1876. Here he made many of the photographs that comprise the Hearst Collection. It was probably during this trip that he met Frances Sneed, who later managed his Montgomery Street studio and became his wife on November 11, 1880 (Watkins' fiftieth birthday). They had two children: a daughter, Julia, and a son, Collis. In 1880, Watkins went to Southern California for the first time and traveled along the line of the Southern Pacific Railroad. Later he went to the "End of the Track" and as far as Tombstone, Arizona. The photographs taken by Watkins on this trip represent some of the earliest views of San Bernardino, San Gabriel, Pasadena, Los Angeles and San Diego. On the way back to San Francisco, he followed the old overland stage road, traveling the greater part of the way in his wagon and photographing most of the Franciscan missions. These pictures constitute the earliest photographic collection of California Missions. On a second trip to the Northwest in 1890, Watkins made a series of stereoscopic views in Victoria, B.C. He extended this trip into Montana where he made 18" x 22" views of the Anaconda copper mines and other properties. His last large commercial job and long country trip was to photograph the development work of the Kern County Land Company near Bakersfield. He made seven hundred views using 8" x 10" dry plate negatives. 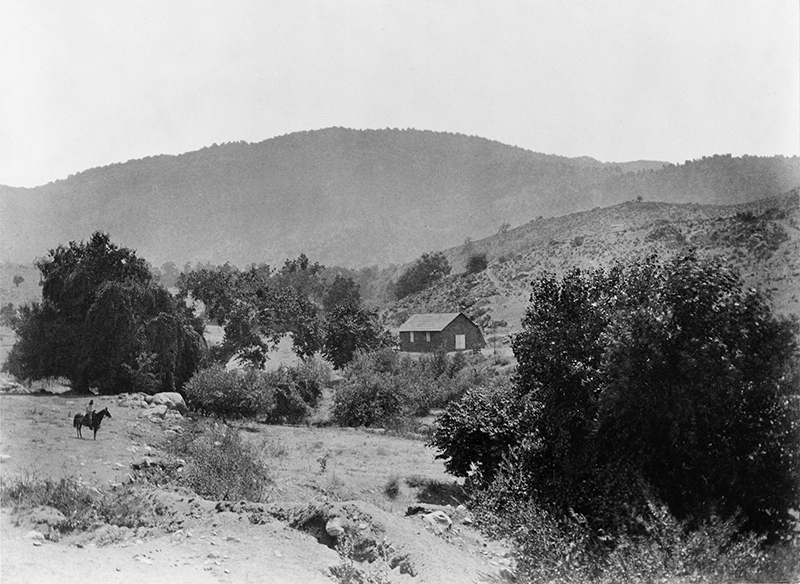 In the late 1890s, Watkins began to photograph the Hearst Hacienda near Pleasanton for Phoebe Apperson Hearst, but ill health prevented him from completing the assignment. Watkins was in the process of negotiating with Stanford University for the sale of his plates, photographs, etc. when the 1906 earthquake struck San Francisco. By this time, Watkins was partially blind, in poor health and experiencing financial difficulties. He had been living with his family in his studio on the top floor of a building on the southeast corner of Ninth and Market Streets. Immediately following the quake, Watkins' wife and daughter went to the refugee camp at the Presidio. Watkins was led by his son to the home of his old friend, C. B. Turrill, who had assisted Watkins financially in the past. Watkins' entire collection was destroyed in the fire which followed the quake. He was shocked by the loss of his life's work and shortly thereafter retired to his small ranch near Capay in Yolo County. The ranch had been deeded to Watkins through the offices of Collis P. Huntington of the Southern Pacific Railroad for his faithful, but unpaid, service to the railroad. Watkins never recovered from the shock of losing his entire collection in the San Francisco fire. He managed to live at the ranch with his family until it became necessary to have him committed to the Napa State Hospital at Imola, Calif., in 1910. He died June 23, 1916, at the age of 87 and was buried on the hospital grounds. Sources: "The Early Pacific Coast Photographs of Carleton E. Watkins" by J. W. Johnson, Professor of Hydraulic Engineering, University of California Berkeley; and "The Life and Photography of Carleton E. Watkins", by Peter E. Palmquist. LO8801: 9600 dpi jpeg from tiff. Copy print also on file.